One hour after birth with Midwife Ryutaki and the Thai Curry I made frantically for everyone just one minute before the mom arrived. Baby came 10 minutes after arrival. I was lucky enough to be part of this woman's life for a few moments, and to catch her quickly-emerging baby. She did not tear, she did not push, thanks to her hu-hu-hu breathing as she panted her baby out. The midwives encircled her, 4 or 6 of them, puffing, chanting, hu-hu-hu, gently reminding her to breathe her baby down and out. It was pure magic. To witness her efforts and the baby's spontaneous emergence. To feel the seemingly enormous roundness of the baby's head against my palms, to protect the mom as the shoulders emerged, to "catch" the soft, wet bundle from her body and hand it to her- pure magic. 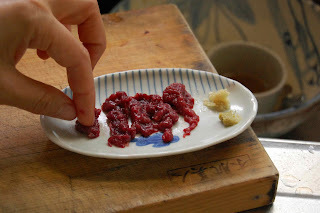 Japanese Birth Houses are different from American Birth Centers, in that Moms and Babies stay for 4-5 days after birth. This allows the moms (often having subsequent babies) a chance to rest, have the cooking done for them, have breastfeeding support, and supportive people to hold the baby when she needs sleep or a bath. It is a very cozy feeling. This mama was surprised as she was the only Mama in the house for her stay. 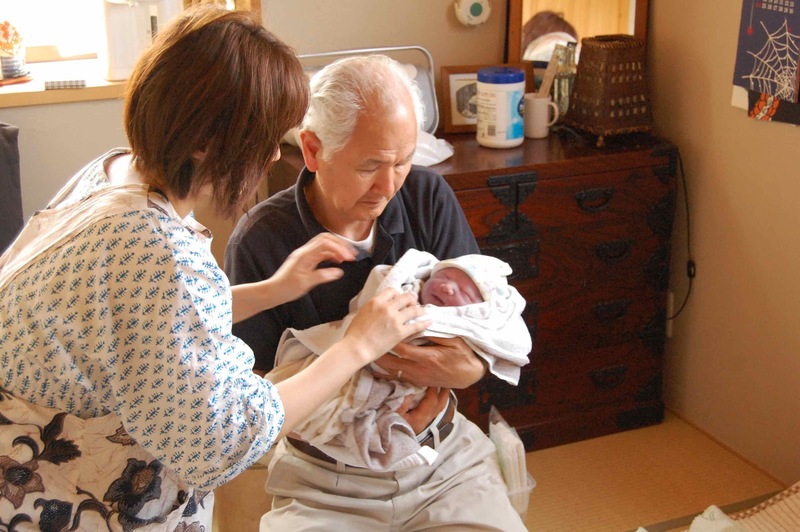 Last time she birthed at Saito Birth House, there were many other mamas to keep her company. She enjoyed the comraderie. She said having me, kayti, around this time was special for her, and helped her feel she was not lonely at all. I felt really blessed to have this woman be my first mama to look after in Japan. Her baby was pretty great too. love it - love your storytelling - and i love this birth house idea. am looking forward to finding one...good motivation for having that next baby in japan! yippee! -sarah n.